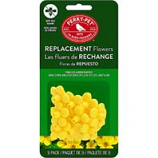 Replacement flowers for bci# 513075 bci# 513237 bci# 513636 bci# 513563. 5-pedal flowerettes. Made in the usa. . .
• Mounts Instantly and Securely. • Durable, Tempered Clear Glass Nectar Container. • Slide Action Bracket Simplifies Bottle Removal. • Two Sculptured Flower Feeding Stations With Bee Guards and Perch. • 3 Different Colors, Decorative and Unique Designs. • Meadow Rose With Copper Vein, Meadow Vine With Green Vein and Meadow Sunflower With Silver Vein. 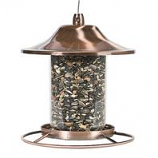 • It Comes With A Removable Wire Circular Perch and Has Four Feeding Stations. 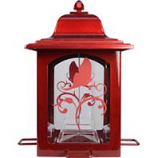 • Shatter-Proof, No-Drip Feeding Base. • Patented Bee Guard Lets Birds Feed, Keeps Bees Out and Built-In Ant Moat. 16 Ounce Capacity. 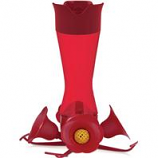 • Has A 360 Degree Perch With Integrated Orange Slice Holders Which Makes The Feeder Irresistible To Orioles. • Includes Free Oriole Identification Chart. • Exclusive, Two-Position Perch Adjusts To Feed All Varieties Of Orioles. • Removable Top Easy To Fill and Clean. • Ready To Hang-Hanging Rod Included. • Patented Bee Guard Lets Birds Feed, Keeps Bees Out and Built-In Ant Moat. 32 Ounce Capacity. Perch design allows birds to feed from multiple angles. Sure-lock cap system helps keep squirrels out. Copper finish. . . Wide mouth opening is easy to fill and clean. Easy to clean base. Caged bee guards. . .
Sure-lock cap system that keeps squirrels out. 4 feeding stations. Bird-preferred u-shape perches. Powder coated red sparkle finish. .